When one thinks of modern francophone populations in Canada, Newfoundland and Labrador hardly come to mind, or at least such was the case until quite recently. This is not surprising given that Newfoundland is the most English of all Canada's provinces, with the French-speaking population accounting for less than one per cent of its 547,155 inhabitants (Statistics Canada 1996). And those who claim only French as their mother tongue do so despite the fact that they are all more or less bilingual. Even the province's proximity to three of the last vestiges of France's presence in North America, namely Québec, Acadia and the islands of St. Pierre and Miquelon, has not been enough to keep the French fact in Newfoundland from remaining largely ignored. French-speaking people can be found throughout Newfoundland and Labrador, but most are located in the eastern and western regions of Labrador and on the extreme eastern and western reaches of the island portion of the province. Although these groups have the French language in common, historical and economic factors make them quite distinct from one another. The majority of western Labrador's present-day francophones originally came from Québec and settled in towns that did not even exist 50 years ago or so. The town of Labrador City-Wabush is situated near the Québec border, and throughout the 1950s and the 1960s many Quebecois took up residence there in order to work in the mining industry. Successive generations of francophones came to refer to themselves as Franco-Labradorians instead of Quebecois. Due to its proximity to Québec and to the number of francophones in the area, many French-speaking entrepreneurs offer business services in their mother tongue. In contrast, the eastern region of Labrador is home to francophones of a broader background. Most of them work at the Happy Valley-Goose Bay military base or airport and therefore do not stay for long periods of time. An overview of French-speaking Labradorians reveals that most of them enjoy a high standard of living, are employed on a full-time basis and are well-paid. The capital city of St. John's is home to a considerable number of francophones who come from many parts of the French-speaking world: Europe, Acadia, Québec, Manitoba, Ontario, Saint-Pierre and Miquelon and the west coast of the island of Newfoundland. They are often professionals who have come to the area to work in federal and provincial government offices or to work or study at Memorial University. Others work in the service industry. For this reason, St. John's francophones are generally well educated and enjoy a high standard of living. Like the francophones of eastern Labrador, they are often transient. Murray Premises, St. John's, NL. 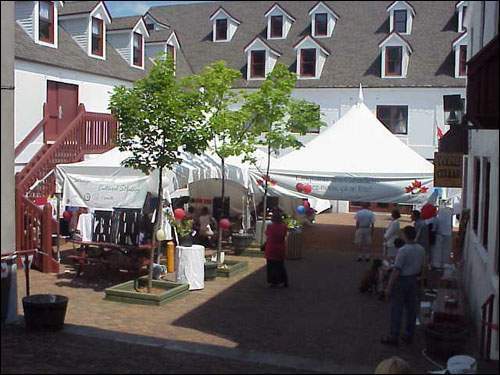 In 1999 the Association francophone de Saint-Jean hosted the very first Franco Fest, a festival dedicated to celebrating francophone culture. Reproduced by permission of L'Association francophone de Saint-Jean. ©2000. Yet another concentration of francophones is found along the west coast of the island. They are the descendants of settlers who arrived from France and Acadia several generations ago, and they live, for the most part, in three areas on the Port-au-Port peninsula: Cape St. George (Cap Saint-Georges), Black Duck Brook (L' Anse-à-Canards), and Winterhouse (Maisons-d'Hiver) and Mainland (La Grand Terre). Other pockets of francophones are scattered throughout the west coast in towns and villages such as Stephenville, Kippens, Marche's Point (La Pointe-à-Luc) and Three Rock Cove (Trois Cailloux). The distinctive speech of these areas has evolved from the French dialects spoken by the Breton fishermen and Acadian farmers who settled in the area in the 19th century. The maritime environment and loan words from English, and even Mi'kmaq, also render their speech distinct from other French dialects. Their standard of living is lower than that of francophones living in Labrador and St. John's. Not only have they had to fight against ever-present assimilation pressures, they have also had to cope with dismal socio-economic prospects, as the lack of industry has forced many to leave the area in search of work. The region was again struck hard when in 1992 the government imposed the cod moratorium, driving the unemployment rate as high as 90% during the ensuing years in some communities in the area. Assimilation has long been a serious problem for the francophones of Newfoundland and Labrador, especially those living on the west coast of the island. With English serving as the language of education, religion and government services, French lost ground among many, but over the past 30 years measures have been taken to reverse this trend. The Official Languages Act of 1969 coincided with a collective rebirth of interest in French heritage on the Port-au-Port peninsula. Since then, federal monies have helped francophone organizations on the peninsula stage the socio-cultural projects essential to the promotion of their identity and language. Prime Minister Pierre Trudeau's visit to the area in 1975 kept alive the renewal of interest in the French culture. Francophone organizations sprang up in other areas of the province, promoting pride and solidarity by taking advantage of the federal policies of bilingualism and biculturalism. As a result, the feeling of inferiority that had long been associated with speaking French in Newfoundland and Labrador began to vanish. The Fédération des francophones de Terre-Neuve et du Labrador is a non-profit organization that was founded in Stephenville in 1973. Presently located in St. John's, it coordinates the activities of the francophone community on a provincial scale. It oversees the business of four other organizations: l'Association régionale de la côte ouest (ARCO), l'Association francophone de Saint-Jean, l'Association francophone du Labrador and Franco-Jeunes. L'Association francophone de Saint-Jean plans activities for the francophone community of the St. John's area and promotes the French heritage on the Avalon peninsula. It is equipped with a French library and video collection and has conducted guided tours of the city in French during the summer. 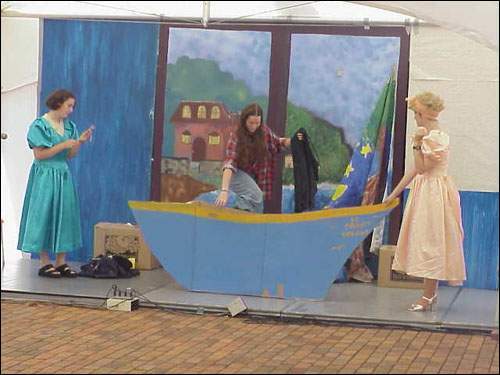 Francophone school children perform a play at the Franco Fest. The offices of l'Association régionale de la côte ouest are located in the Centre communautaire et scolaire Sainte-Anne at Mainland (Grand Terre), which also houses the museum, the family resource centre and the community radio and television stations administered by ARCO. ARCO also works in the area of economic and tourist development, organizes regional music festivals and offers literacy courses in French. Franco-Jeunes is a youth-oriented organization whose mandate is to protect the French language among francophones aged 13 to 24 years, by giving them the opportunity to participate with other young francophones in local, provincial and national activities. L'Association francophone du Labrador (AFL) maintains a community centre where francophones from the west of Labrador can meet. Since its inception in 1973, the AFL has organized various family oriented activities as well as social, cultural and sporting events. Reproduced by permission of L'Association francophone du Labrador. ©2000. La Fédération des parents francophones de Terre-Neuve et du Labrador, besides offering preschool classes and organizing extra-curricular activities, was a key factor in the establishment in 1997 of the province's first francophone school board. As well, since 1984 the newspaper Le Gaboteur has offered an opportunity for French Newfoundlanders and Labradorians to read about current affairs that are relevant to them. Reproduced by permission of the Fédération des francophones de Terre Neuve et du Labrador. ©2000. On October 5th, 1986, the Fédération des francophones de Terre-Neuve et du Labrador officially adopted a flag designed by Lily Fortin of St. John's and raised it for the first time at Mainland (Grand Terre) in 1987. The flag reflects the origins of French Newfoundlanders and Labradorians by borrowing the red, white and blue from the flag of France and the yellow of the star of the Acadian flag. The yellow of the sails also recalls the colour formerly associated with the French fleur de lis. In addition to symbolizing action and progress, the sails bring to mind French explorers, as well as the Basque, Breton and French fishermen who crossed the Atlantic ocean as early as the sixteenth century to fish the waters off the island of Newfoundland. A spruce twig on the topsail stands for the mainland portion of the province, while the pitcher plant of the lower sail represents the island portion. The diagonal lines separating the red, white and blue sections of the flag evoke the vitality of Newfoundland's French-speaking population (Harrington 141-143).